I recently took one of those Facebook “tests”. You know, the ones that reveal your hippie name, which woodland creature you are, or what state you should be living in. If my results can be trusted, I’m Sunshine the hedgehog from California! These tests are fun, but usually leave me a bit annoyed at the time I have wasted taking them. This test was different. It was a Myers-Briggs personality type indicator test, and the results left me deep in thought and intrigued to learn more. Today, the test is frequently used for team building, career counseling, marketing, leadership training, life coaching, personal and professional development, and marriage counseling. The results of this personality test revealed that I am an INFJ – Introverted iNtuitive Feeling Judging (I have since taken a different version and got the same result). When first reading the quick descriptions of all the types, I found bits of myself in every one of them. The generic initial descriptors left me wondering about the validity of the results. It felt like I was reading horoscopes that could be talking about anyone – basic human traits. But then, I saw this: Only one percent of the population has an INFJ Personality Type, making it the rarest of all types. gentle, caring, complex and highly intuitive. artistic and creative, and live in a world of hidden meanings and possibilities. know things intuitively, without being able to pinpoint why, and without detailed knowledge of the subject at hand. uncanny insight into people and situations – you get a “feeling” about things and intuitively understand them. have experiences of a psychic nature. Other types scoff and scorn at this type of thing, and you don’t really understand your intuition at a level which can be verbalized, so you are protective of your inner self, and share only what you choose to share – you hold back parts of yourself and can be secretive. trust your own instincts above all else. This makes you look stubborn to others – because you often ignore their opinions. a natural nurturer, patient, and protective of those you love. The list goes on and on, and delves into great detail about every nuance of this personality type. The more I read, the more “right” it all felt (the good, the bad and the ugly). And when I read the full description, I actually learned a few things. Now I understand that it is natural that I can’t always put into words the “knowing” I sometimes feel, or the “feelings” and “intuitions” that just come to me, with great confidence. I don’t have to beat myself up when I can’t “think on the spot” – I know that my personality needs time to let it percolate, time to sleep on it and let my intuition tell me what feels right. Also, I’ve always known that I can be bossy and stubborn and unapologetically hard-nosed when I feel strongly about something, and it has caused me a great amount of confusion and guilt in the past, because I can’t explain why I feel so strongly. Now I know that it’s an integral part of my being to feel strongly about things that can’t be seen, touched, or explained. From now on, I will stop trying to reconcile the dichotomies within my own personality – the seeming opposites, the discrepancies, the contradictions. I am complex and intuitive, sensitive, artistic and a little bit psychic – and, with a little science to back it up, I’m finally learning how to be comfortable in this skin. 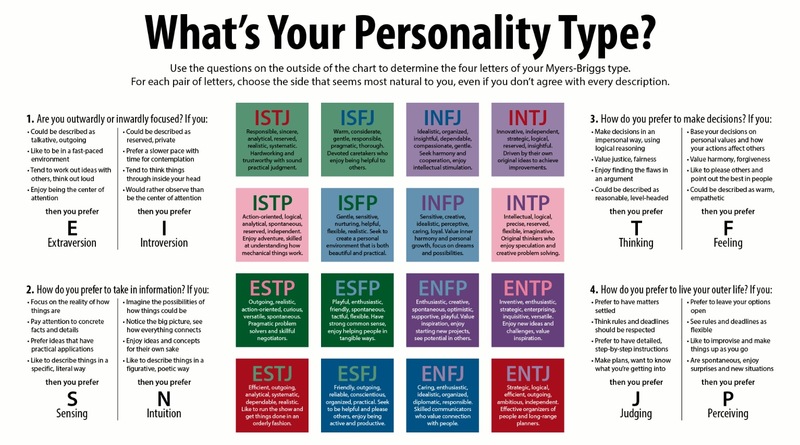 What personality type are you? Do you agree with your test results? I’m an ENFJ, which means we’re pretty close! I really do agree with the results… it pretty much hits it on the nail! We are close! I’m glad to hear you feel your results are accurate too. Mine was spot on! I am also an INFJ. I took my test during college for a phycology course. For me it was the start of being able to accept myself. For so long I had been told something was wrong with me. I was too shy, too quiet. If I couldn’t get over my anti-social behavior I would have a hard time later in life. It was so hard to love myself when I kept being told that I needed to change. Finding those four little letters changed everything for me. I learned that there wasn’t anything wrong with who I was, and that it really was ok to just be me. Quirks and all. Reading about INFJs was like reading an articles about myself. Like, someone had be following me around my whole life, writing about me. In a way is was sort of creepy, but at the same time it was very reassuring. I’m a ISFJ, pretty close to the same as you Ness. I’ve heard of these test but never taken one. I think it’s pretty accurate too but I do think that I am intuitive and have a feeling about things without knowing how or why sometimes too. Interesting! ISFJs are interested in maintaining order and harmony in every aspect of their lives. They are steadfast and meticulous in handling their responsibilities. Although quiet, they are people-oriented and very observant. Not only do they remember details about others, but they observe and respect others’ feelings. Friends and family are likely to describe them as thoughtful and trustworthy. ISFJs, or “Protector Guardians”, are most concerned with taking care of people by keeping them safe and secure. They are modest caretakers who do not demand credit or thanks for their efforts. But while they are essentially compassionate—and in fact exercise more patience in dealing with people with disabilities than perhaps any other type—their shyness with strangers can lead others to misread them as standoffish. Only among friends and family may this quiet type feel comfortable speaking freely. ISFJs are serious people with a strong work ethic, not inclined to self-indulgence. They believe in being meticulous and thrifty. They work well alone. While they may enjoy taking care of others, they do not enjoy giving orders. That sounds just like you! Is this the first time you’ve taken this type of test? I think it’s a handy tool to have – helps us understand how we tick – and why! I took the test and it says I’m a ISFJ (Introvert, Sensing, Feeling, Judging). After reading the detail I agree mostly. One of the points it made is that ISFJs “exercise more patience in dealing with people with disabilities” and I can’t say I agree. Well, imagine that. As I typed the last sentence I was going over in my head why I disagreed and it was mainly because I couldn’t imagine dealing with anyone with a disability. But I realized that I do that at least once a month at work when I arrive at the same time as the guy who works in the mail room and is a paraplegic. Hmm. The other point I disagree with is the “thrifty” and “not inclined to self-indulgence”. I don’t handle money well and I have a problem with buying shoes I can’t wear. Granted they’re usually from Goodwill and don’t cost much but I shouldn’t buy them in the first place. Otherwise? Yeah, this was very, very familiar. Janey, I know what you mean, there are little things that might not be exactly right, and there is a little bit of everything in all of us. I just find it fascinating that by answering those few questions, it pegs us pretty well! Indeed; it was more on than off. It’s almost a little creepy. I found out I am an INFJ a couple of months ago…and it really has been life changing for me! I no longer feel like there’s something inherently wrong with me! I’m “normal” for my type. One thing I’ve learned in my research is that we all have “learned behaviors” which go contrary to our “type”, which is why a couple of things might be “off” when reading about your type. Case in point, my husband! He tested as an ESFP…from my research of ESFP’s he just didn’t fit the description right away, not until I looked Past his behavior and looked at what Motivated his actions…and sure enough…he’s a very guarded ESFP and has many “learned” behaviors from his ESTJ mother!! Hi Heather! Thanks for sharing. I’ve found the same to be true – that none of us fix exactly into a perfect box. Knowledge is power! I took three different test and got INFJ. Fits really well. Quetly spoken, but passionate! Another INFJ here. I take the test periodically (in english, the same test) and everytime i get the same result: INFJ (only the percentage for “I” varies a bit…perhaps depending on how i feel in that moment… more or less close to E). I tried once to take the test in my mother language (for curiosity, even though i had full control over the english used in my previous tests, in my mother tongue the questions were conceived a little bit different, but apprenty were more commercial than the english ones) and the result was INTJ. Most would say INTJ are more unsensitive and maybe cruel (for leading themselves by logics only), but i remember that the question i found most difficult to answer (in both languages) was: “Do you value most the truth or mercy?”. It is precisely the question that makes difference between the 2 types. Yet I dont know what to answer. All my life I had the very same question to ask myself, if i am more on the intellectual side or in the emotional one. I’m still in doubts. I do really appreciate the intellectuality in humans (in such extent that i rather share my life with someone more intelligent and less emotional than with someone more emotional and less intelligent…strange), but in the same time i am a fiery crusader of morals, i strongly criticize the lack of empathy and i have a strong bond to human values. Another odd stuff is that i find extremely exasperating when i see people taking risks stupidly saying “i feel its gonna be fine” but in the same time i have apparently very strong instincts and experience showed me its a true blasphemy not to rely on them. My instincts always would have led me to the right spots even though i often choosed not to judge or make decisions without having concrete proofs, so based only on my instincts. And everytime i got hurt taking this way, I came back to my instincts and i bend, respectfully, over. Hello Irina, Thank you for your comment. What I’ve found over the years, is that most of us have aspects of all personality types, and like you pointed out, some questions warrant different answers depending on mood, circumstances, and even whim, on occasion! Have a great day.